DAVID BEGBIE BA (hons), HDFA Slade, MRSS. Drawing in Air – David Begbie transforms a light-weight steel or bronze wiremesh spectacularly into a dynamic three-dimensional figurative form. His transparent sculpture in wiremesh is as much about light as it is about substance and he transforms his seemingly inanimate machined industrial material into dynamic and evocative sculptural forms. 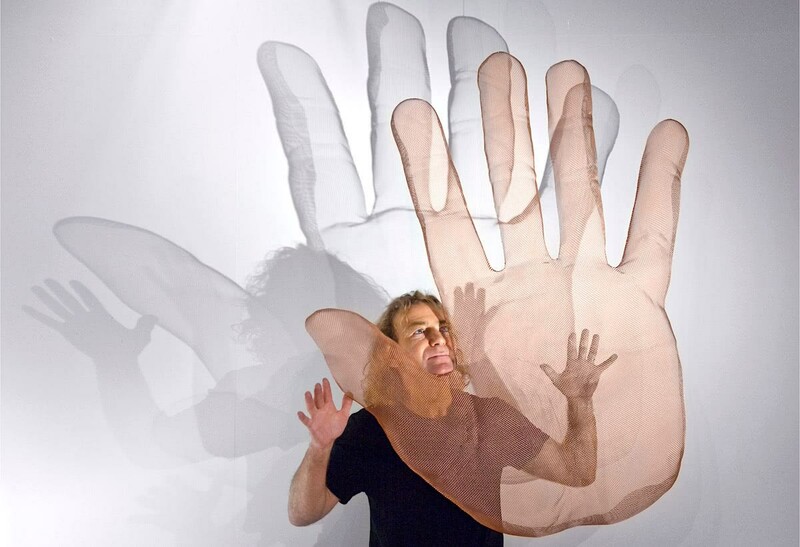 A ’Begbie sculpture’ is hand-crafted and never moulded – a unique semi-transparent artwork with its individual character, made of a single sheet of bronze or steel mesh. Each wire sculpture is modelled using very own (self-made) tools and ’fixed’ joining each wire intersection so that the artwork is robust and stable. Each wiremesh sculpture is an entity which has a far greater physical presence than any solid object could possibly have, because it has the power to suggest that it doesn’t exist. The introduction of lighting is an integral part of a particular composition and has the most remarkable result. The use of projected shadows creates an optical fusion of image and object. This website features examples of available sculpture from the artist’s studio and gallery. Please enquire for further artwork at the studio letting us know your desired sculpture size and subject by e-mail and we’ll provide photos, prices and details of a suitable wire-mesh sculpture and/or suggest a commission. If you wonder how a contemporary ”Begbie sculpture" looks in your environment, we offer to super-impose a sculpture suggestion into your photo - just share a snapshot by e-mail. "Masculinity and femininity, positive and negative, matter and antimatter, light and dark: The artist of the light and the shadow. David Begbie transparent sculpture is as much about light as it is about substance. The introduction of strategic lighting creates optical compositions of line and form, and each transparent sculpture has a greater palpable presence than the space, which it occupies. David Begbie is one of the most influent sculptor in England with solo shows in four continents, works being collected by many museums as well as an extensive list of public and private commissions."